alaTest has collected and analyzed 15 reviews of Asus Chromebox 3. The average rating for this product is 4.0/5, compared to an average rating of 4.1/5 for other Desktops for all reviews. Reviewers are impressed by the price and size. The design and usability also get good comments. We analyzed user and expert ratings, product age and more factors. 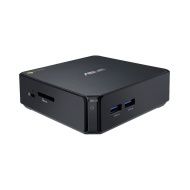 Compared to other Desktops the Asus Chromebox 3 is awarded an overall alaScore™ of 96/100 = Excellent quality. The Asus Chromebox 3 delivers a full desktop Chrome OS experience, with impressive portability when needed. Not all apps are optimised for desktop use. It’s hard to get truly excited by a Chromebox, but the ASUS Chromebox 3 is a very good little machine if you just want to run some basic web-based tasks. The system runs very snappy. You don't notice it stuttering even running chrome with 30+ tabs open. The keyboard and mouse worked right out of the box. It starts up quick, one of many bonus' to this device.